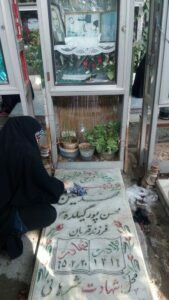 A group of young people in Iran have launched a campaign on social media networks to clean up and colour the tombstones of martyrs, raising the awareness of younger generations about the country’s national heroes. The move comes to please martyrs’ mothers and safeguard the historic value of the martyrs’ section at Behestht-e-Zahra cemetery in southern Tehran. Life never stops at martyrs’ section of the cemetery. The reason behind it is the affinity between sons and mothers, who come to visit their sons’ final resting places at the weekend. If you walk in the quite martyrs’ section of the cemetery, you may run into mothers who have wrapped their chadors around their waists and take their time to wash up and sweep the tombstones with shaky hands. When they are happy with how clean the gravestones are, they begin reciting verses from the holy Quran and keep waiting to entertain visitors to the martyrs with date and fruit. Now, a few young enthusiasts have launched the “For the Martyr” campaign on social media to restore the martyrs’ tombstones in cooperation with people. They say they want to both make martyrs’ mothers happy and safeguard the country’s national heritage. We talked to Mahdi Ayat, the manager of the group who, himself, is a researcher and documentarian. He said the many number of times that his friends have visited the cemetery over the past couple of years made them look at the martyrs’ section differently from those visiting the place once in a blue moon. 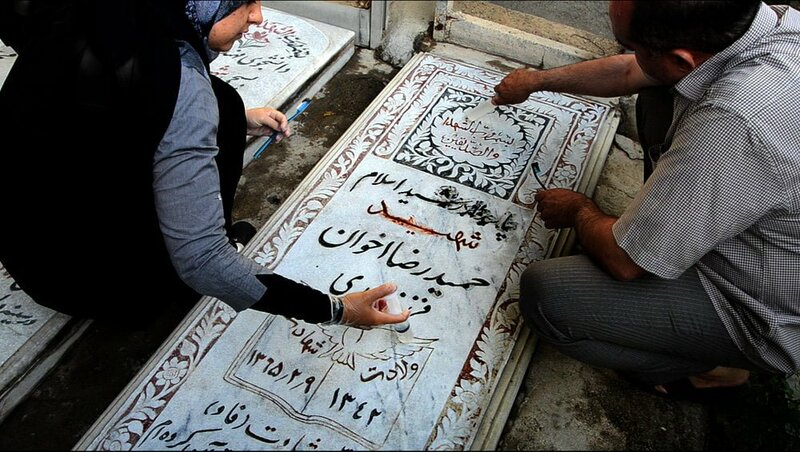 “Over this period, we saw a large number of the martyrs’ old tombstones had gone black. Moreover, we listened to the concerns of martyrs’ families. Maybe we don’t care about it that much, but the tarnish on the gravestones make a martyr’s mother sad and she tells herself what she’s supposed to do now. So, we decided to do something. My friends and I formed a group. One of them was a martyr’s child, one was a defender of holy shrines, another a war veteran and …,” said Ayat. 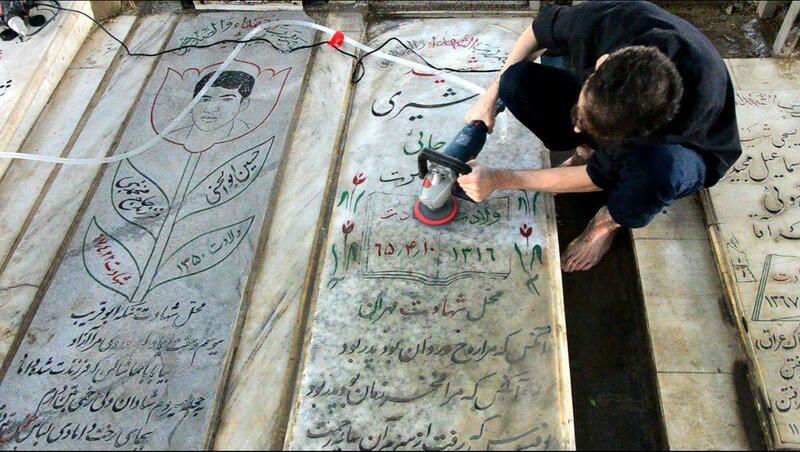 Members of the “For the Martyr” campaign seek to scrub the tombstones clean rather than having them replaced. Replacing martyrs’ gravestones is legally forbidden. Most of us are unaware of the law. “By Replacing the tombstones, whether the Martyrs Foundation or even martyrs’ families are doing an illegal act,” said Ayat. “On the strength of Article 564 of Book Five of the Islamic Penal Code (the section on deterrent punishment), anyone who repairs, destroys, restores or even expands whatever regarded as cultural heritage without permission from the Cultural Heritage Organization, he/she must not only compensate for the damage inflicted, but will be imprisoned for three months to two years,” he added. “Apart from being located at a pilgrimage site, the martyrs’ section is four decades old and considered a popular arts museum of the country,” he said. The fine and delicate designs together with the information on the tombstones also contribute to the historical value of the martyrs’ section. 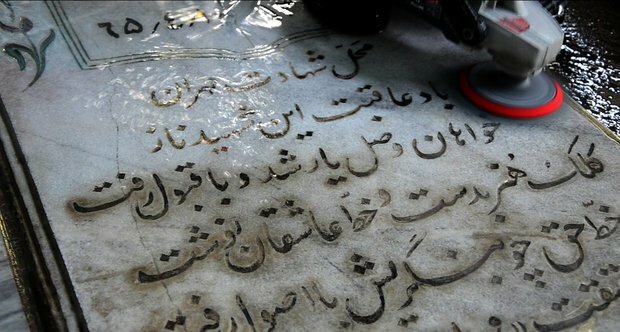 “Moreover, the martyrs’ section is like a document … There are a series of words and expressions on the tombstones whose omission will look as if part of history is omitted, things like bombardment of cities, chemical attacks, SAVAK (the intelligence service of the former Pahlavi regime of Iran), torture, movement, Imam, revolution, Saddam, enemy, hegemony and …,” he said. “We have collected our money to pay for the equipment and have not received any budget from any institution. We deliberately refuse to get funding from other institutions because we want to tell people that we are responsible with regards to martyrs. 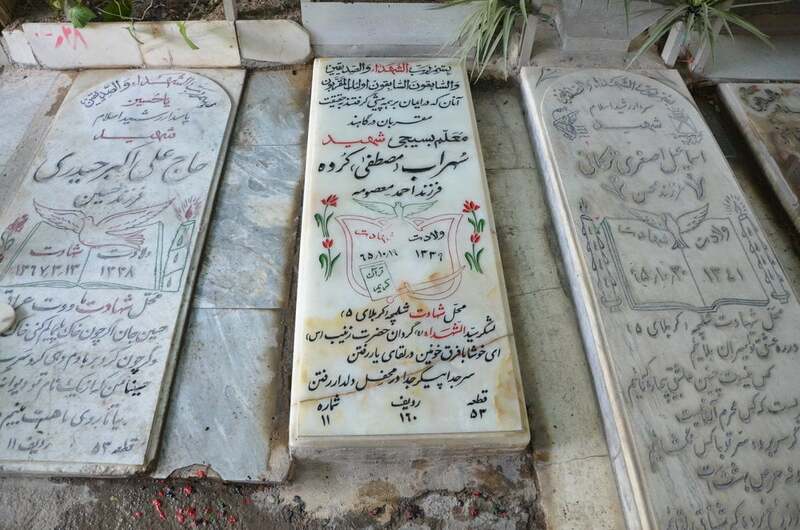 There are 30,000 martyrs buried in Behesht-e-Zahra: 26,000 are known and 4,000 unknown. The parents of between 50 to 60 percent of those martyrs have passed away as well, and there are a considerable number of martyrs that have few or no visitors,” he said. Ayat says they are just at the beginning of their work and have no idea how all martyrs’ mothers will react, but he says he has met one of those mothers and she was very pleased with all the work.